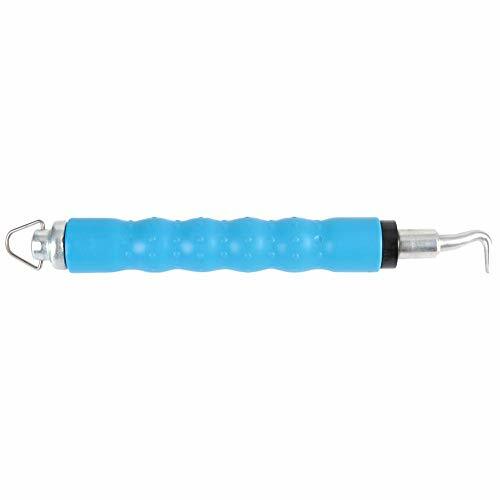 Kit comes with 1- New design: Retriever, Rolling Magnetic w/Rubber "Bicycle Grip" has 30% more pulling strength! 1- New design: 1 1/4" Round Tapered Bullet Drop Magnet w/Braided Brass Flex 13" Leader* & Fish Eye-Let (fits 3/4" hole) has 25% more magnetic strength & the tapered bullet gives it less drag...1- Pull Chain, 1- Operation Manual, 1- Black Blow Molded Carrying Case, Custom Form Fitting Tool Compartment w/Stowaway Handle & 2 Metal Latches (14" X 11" X 4"). New design: BMCASE N/C. This incredible tool will give you a return on your investment the first time you use it! MagnePull cuts wire fishing time by up to 70%! Eliminate multiple trips in & out of attics and crawl spaces. 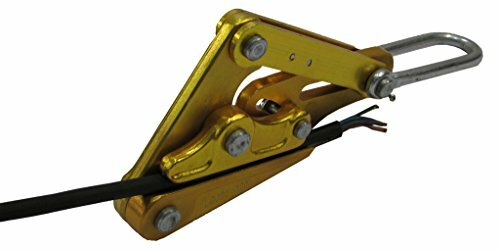 This amazing tool magnetically couples the cable-pulling device through drywall & allows technicians to have complete control. 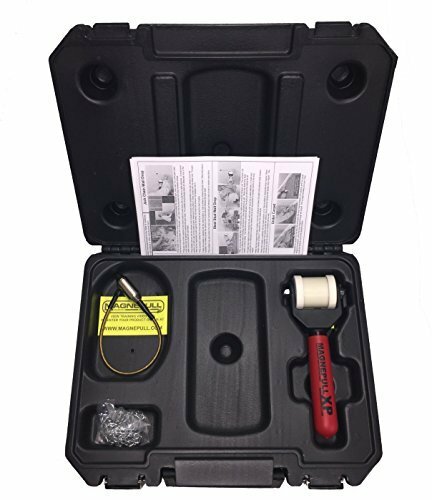 The system was developed to work with wood studs, insulated walls, and for metal studs you will need the OPTIONAL XP1000-8 Magnet! Great for Alarm, Cable, Satellite, Home. Note*** Designed for Professionals only, not designed for DIY applications. New design: Retriever has 30% more pulling strength! MagnePull cuts wire fishing time by up to 70%! The Greenlee cable caster takes running wire to a whole new level. Shoot a dart with an attached string up to 50 feet. 50-foot, 15 m, range allows for faster installations with fewer pulls. Bright yellow body reduces chances of leaving the CableCaster behind. Glow-in-the-dark darts minimize replacement costs because they are easy to locate. Aerodynamic darts provide high accuracy and fast installation. Optional flashlight improves visibility. Easily pull wire and cable with Klein Tools Pulling Grip. 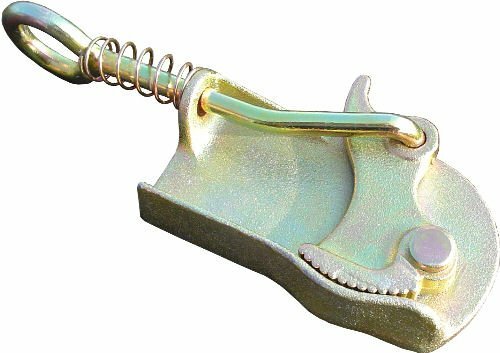 It is designed to clip onto the hole in the tip of a flex bit for easier pulling. This grip can pull up to 9/16-Inch diameter wire and cable through a wall. Wire mesh holds the wire during the pull. Swivel end helps reduce twisting. Capacity: 1/2-Inch - 9/16-Inch. For more than 160 years, Klein Tools has manufactured premium-quality, professional-grade hand tools that deliver the performance, durability and precision needed to get the job done right. Our family of engineers, workers and craftsman continue to put six generations of expertise into every tool we create by using only the highest quality materials, superior workmanship, and keeping manufacturing as close to home as we can. Klein isn't just the name of our company, it's also our family name. And since we're an American company that's family-owned and family-run, you know you can count on us to be here tomorrow. Klein Tools doesn't just make great products, we make great products that stand up to the demands of the professionals who use them every day ... Since 1857. Klein Tools' 1604 Series Messenger and Guy Strand Haven's Grips are designed for use when a light, compact grip is desired, and where cable deformation is not a factor. They are recommended for use with steel strand cables. All Klein grips are manufactured from custom drop-forged steel that is machined and heat treated for excellent durability. Each grip is individually hand inspected and actuated for proper function. Grips are also rigorously tested and pulled to rated load to ensure the highest quality and reliability. 5,000-pounds (2,268 kg) Maximum Safe Load. .125-Inch - .50-Inch (3.18 mm 12.70 mm) cable diameter range. Gripping pressure of the knurled jaw is applied to -Inch (6.35 mm) cable area. For more than 160 years, Klein Tools has manufactured premium-quality, professional-grade hand tools that deliver the performance, durability and precision needed to get the job done right. Our family of engineers, workers and craftsman continue to put six generations of expertise into every tool we create by using only the highest quality materials, superior workmanship, and keeping manufacturing as close to home as we can. Klein isn't just the name of our company, it's also our family name. And since we're an American company that's family-owned and family-run, you know you can count on us to be here tomorrow. Klein Tools doesn't just make great products, we make great products that stand up to the demands of the professionals who use them every day ... Since 1857. Wide Usage: Inserts and cuts terminations in one simple operation for cat6a /cat6 /cat5e /cat5 /network cable. Ergonomic design: Comfort grip that is easy to handle, adjustable impact-force settings (lo/hi) for various cable termination applications. With spare storage that helps prevent blade loss, the precision blades are conveniently interchangeable and reversible between 110 and BK blade. The extra wire stripper makes wire cutting more convenient, and the punch down tool offers reliable, easy-to-use operation at an affordable price. Adjustable high and low actuation setting accommodates termination requirements or user preference. The impact adjustment dial adjusts the force of the spring-action from low to high to meet different installation applications. Greenlee 31000 Specifications: Cable Diameter Range: 1.0" - 1.49" (25.4mm - 38.0mm) Maximum Rated Capacity: 3280 lbs. 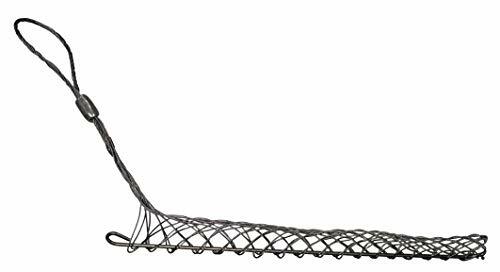 (14.5 kN) Eye Length: 7" (177.8 mm) Mesh Length: 33" (838.2 mm) Rotating Eye Diameter: 1-3/8" (34.9 mm) Greenlee 31000 Features: Use to pull in: conduit or tray. Type of pulls: heavy-duty, long, hard runs. Type of grip: double-weave galvanized steel mesh with flexible pulling eye. Select the grip with a maximum reated capacity that meets or exceeds the cable puller's maximum pulling force. Klein Tools' 1604 Series Messenger and Guy Strand Haven's Grips are designed for use when a light, compact grip is desired, and where cable deformation is not a factor. They are recommended for use with steel strand cables. All Klein grips are manufactured from custom drop-forged steel that is machined and heat treated for excellent durability. Each grip is individually hand inspected and actuated for proper function. Grips are also rigorously tested and pulled to rated load to ensure the highest quality and reliability. 2,500-pounds (1,134 kg) Maximum Safe Load. .06-Inch - .25-Inch (1.52 mm 6.35 mm) cable diameter range. Precision machined jaws for proper alignment. For more than 160 years, Klein Tools has manufactured premium-quality, professional-grade hand tools that deliver the performance, durability and precision needed to get the job done right. Our family of engineers, workers and craftsman continue to put six generations of expertise into every tool we create by using only the highest quality materials, superior workmanship, and keeping manufacturing as close to home as we can. Klein isn't just the name of our company, it's also our family name. And since we're an American company that's family-owned and family-run, you know you can count on us to be here tomorrow. Klein Tools doesn't just make great products, we make great products that stand up to the demands of the professionals who use them every day ... Since 1857. 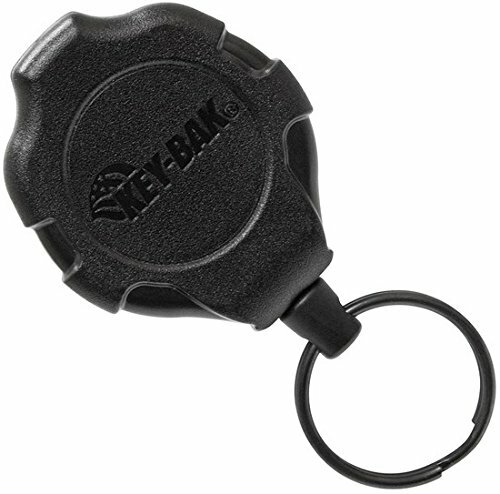 KEY-BAK ratch-it retractable ratcheting tether locks the reel in 5 intervals. Just pull the retractor to the desired length and the cord will lock in place. With an easy tug on the cord, the reel unlocks and retracts. 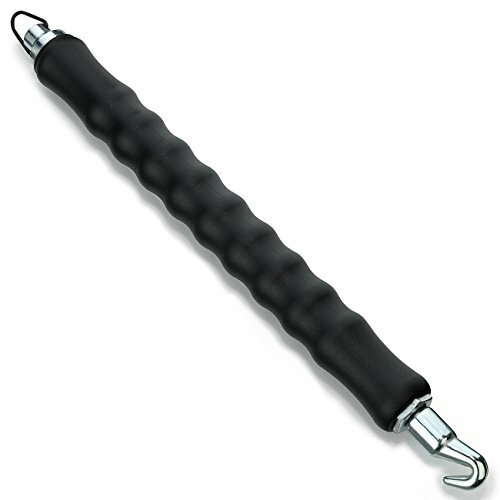 Available with metal carabineer or belt clip and in 3 retraction forces ranging from heavy duty 8 oz. To Xtreme duty 20 oz. Of retraction force. A cable puller with a maximum pulling force of 20 kilonewtons(KN). 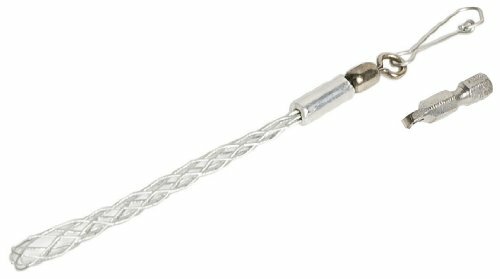 Capable of pulling cable of 1/8" to 7/8" in diameter Cable puller is not recommended to use for steel wire rope, hard material could slip out of the grip. Klein Tools' voice/data/video wire pick enables manipulation of wires at busy blocks and panels. Grab wires or clean out debris in confined spaces with ease. No more messy blocks or panels. Pick up, separate or remove wires, small components, covers or debris from panels, blocks or jacks. Pull bridge clips from 66 blocks. Non-conductive material prevents shorts when pulling wire. Non-conductive body material prevents shorts when pulling wire. Includes a metal hook end and non-conductive spudger end. 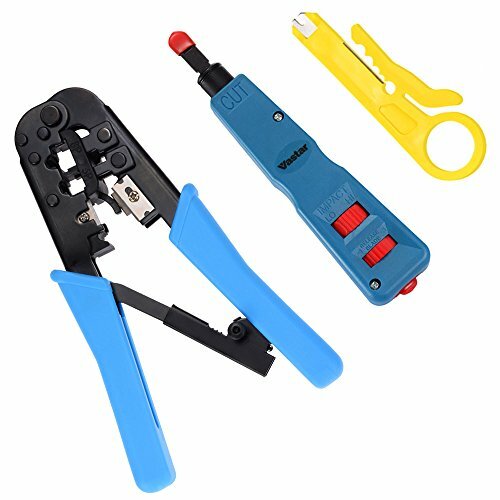 See our Cushion-Grip Impact Punchdown Tool Kit (VDV427-822) for everything required to install and maintain 110 and 66 panels, cross-connect systems and wall jacks. For more than 160 years, Klein Tools has manufactured premium-quality, professional-grade hand tools that deliver the performance, durability and precision needed to get the job done right. Our family of engineers, workers and craftsman continue to put six generations of expertise into every tool we create by using only the highest quality materials, superior workmanship, and keeping manufacturing as close to home as we can. Klein isn't just the name of our company, it's also our family name. And since we're an American company that's family-owned and family-run, you know you can count on us to be here tomorrow. Klein Tools doesn't just make great products, we make great products that stand up to the demands of the professionals who use them every day ... Since 1857. ADVANCED GEAR CLUTCH DESIGN, quality steel material, internal carbon steel hardness 45, steel bar surface electrophoresis treatment (black), durable, high strength and wear resistant. SOFT NYLON SHELL, waterproof, even in the cold winter, it will not become stiff, comfortable to grip. RETRACTABLE STRUCTURE, a thread + rebound structure inside, can rotate and retract freely, fast and efficient, easy to use to tie the wire easily and bind rebars tightly. 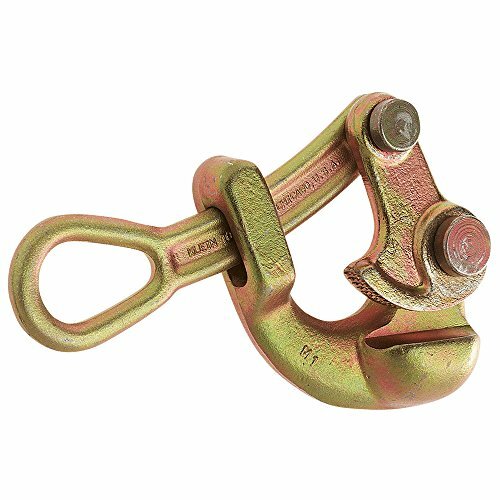 RANGE OF APPLICATION, the rebar hook is applicable to construction site or goods shelf bundling reinforcement. AFTER-SALE GUARANTEE, Tanus is only seller authorized by the Hilitand brand. We care for every customer's feeling. If this product does not meet or exceed your expectations, please contact us at first, we will solve the problem immediately. - Made of alloy steel, strong and durable. - High occlusion, strong clamping performance, can grip wire tightly without damaging it. - The swing latch is designed to help hold cable in the jaw. 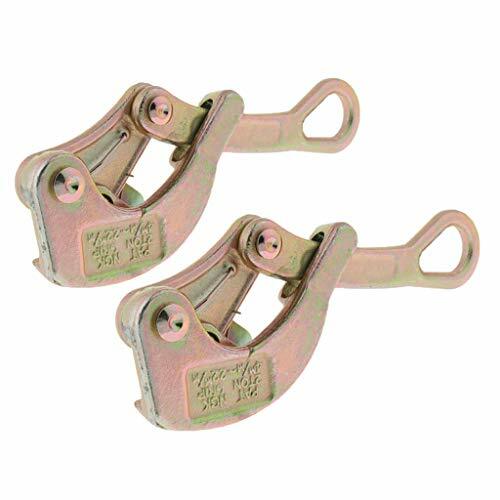 - Suitable for gripping steel strand, aluminium cable steel reinforced, steel wire rope, etc. - Applied for tension wire, communications industry, etc. Please allow slightly size error due to manual measurement. Color might be slightly different since different monitor and light. Please make sure you don't mind before you order. Thank you. Split Mesh Basket Grip 0. 75" - 0. 99"